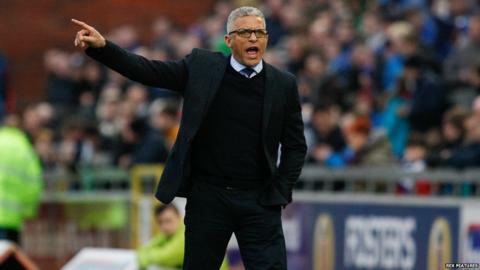 Carlisle manager Keith Curle says he was not leaving former club Notts County without a victory on Saturday. Curle, sacked as Notts boss in February 2012 after less than a year at Meadow Lane, led Carlisle to a 5-0 win. "One of the tactics used was fear," Curle, 52, told BBC Cumbria. "They knew if they came off that pitch without a positive result they were going to get me and they were going to get me 100% - because I don't come here and get beat." The former England defender continued: "We said look - Colin West, Lee Fern, Lee Dykes and myself have all been employees of Notts County. The message was 'I'm not leaving that football club without a result'." Curle left the Magpies sitting 10th in League One and five points adrift of the play-off spots. "People have often asked me why I got the sack? What I would say is relationships with people who own the football club weren't right," the former England defender said. Saturday's triumph ensured Carlisle finished 10th in League Two, an improvement of ten places on the previous season, while Notts ended their first campaign back in the fourth tier in 17th place. "We've demanded that we finished the season in the right way," the former Manchester City defender added. "Keeping that competitive edge, keeping that level of commitment - making sure the players haven't got their flip flops on and are putting their towels down on the sun loungers."